348 Beacon is located on north side of Beacon, between Fairfield and Gloucester, with 346 Beacon to the east and 350 Beacon to the west. 348 Beacon was designed by Allen and Kenway, architects, and built in 1886-1887 by Norcross Brothers, builders, as the Boston home of Elisha Slade Converse and his wife, Mary Diana (Edmands) Converse, and their son-in-law and daughter, Costello Coolidge Converse and Mary Ida (Converse) Converse. Costello and Mary Converse were first cousins (he was the son of Elisha Slade Converse’s brother, James Wheaton Converse). Both families lived in Malden. Elisha and Mary Diana Converse also previously had maintained a Boston residence at the Hotel Vendôme and, before that, at 1 Gloucester. Elisha Slade Converse was treasurer of the Boston Rubber Shoe Company, president of the Rubber Manufacturers Mutual Insurance Company, and president of the First National Bank of Malden. He was Malden’s first mayor and had represented it in the Massachusetts legislature in the early 1880s. Costello Converse was treasurer of the Boston Cold Storage and Freezing Company and later assumed his father-in-law’s interests in the Boston Rubber Shoe Company. Elisha Converse purchased the land for 348 Beacon on May 22, 1885, from textile manufacturer Charles Walter Amory. 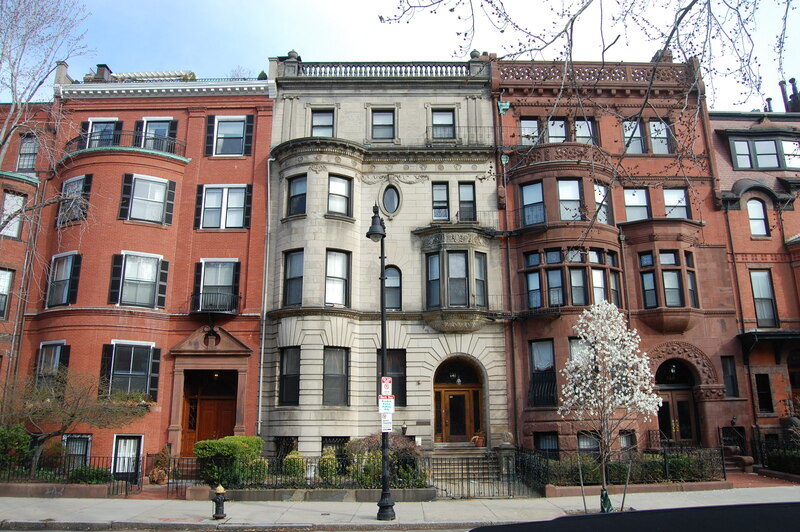 He and his wife, Elizabeth (Gardner) Amory lived in Brookline and later would build a home at 278 Beacon. 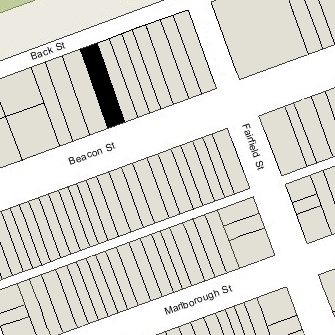 The lot purchased by Elisha Converse was 50 feet wide, part of two larger lots originally sold by the Boston and Roxbury Mill Corporation on January 26, 1881: the eastern 25 feet being half of a 50 foot purchased from the company by Charles Amory, and the western 25 feet being half of a 50 foot lot purchased from the company by Lewis S. Dabney, who then sold it to Charles Amory. Elisha Converse retained the eastern two-thirds of the lot, with a frontage of 33 feet 4 inches, on which 348 Beacon was built, and sold the remaining 16 feet 8 inches back to Charles Amory on July 20, 1885. Then, on May 21, 1887, he bought it back from Charles Amory along with an additional 16 foot 8 inch lot. He left the lot vacant for the next eight years. Click here for an index to the deeds for 348 Beacon. Costello Converse is shown as the owner of 348 Beacon on the original building permit application, dated March 17, 1886. The property was numbered 346 Beacon until 1889. The house was completed by the 1887-1888 winter season and became the winter home of both Elisha and Mary Diana Converse and Costello and Mary Ida Converse. They also continued to maintain a residence in Malden. On December 2, 1891, Elisha Converse transferred 348 Beacon to his daughter, Mary Converse. Both families continued to live there and in Malden. On September 27, 1895, Elisha Converse sold the 33 foot 4 inch lot at 350 Beacon to Albert Geiger. As part of the transaction, Elisha Converse included restrictions in the deed specifying that only a single-family dwelling could be built on the land, that the rear wall of any building at 350 Beacon could not extend further than the rear wall of 348 Beacon, and that any bay on the rear of 350 Beacon could not extend further than the bay at 348 Beacon. Mary Diana Converse died in December of 1903, and Elisha Converse died in June of 1904. 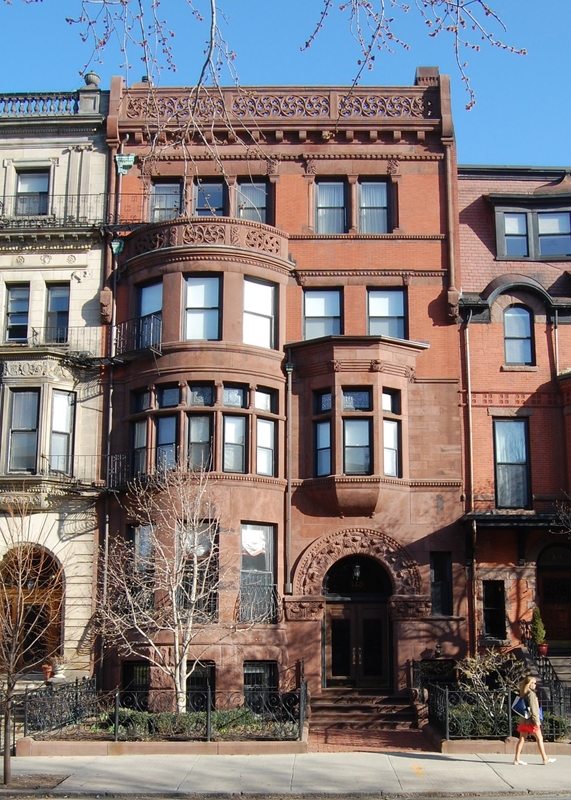 Costello and Mary Ida Converse continued to live at 348 Beacon. They also maintained a home in Magnolia. Mary Ida Converse also inherited the home built by her father on Belmont Hill in Malden. On April 3, 1931, that house — which had been vacant for seven years — was seriously damaged by a fire in which six firemen were injured. Costello Converse died in November of 1931. 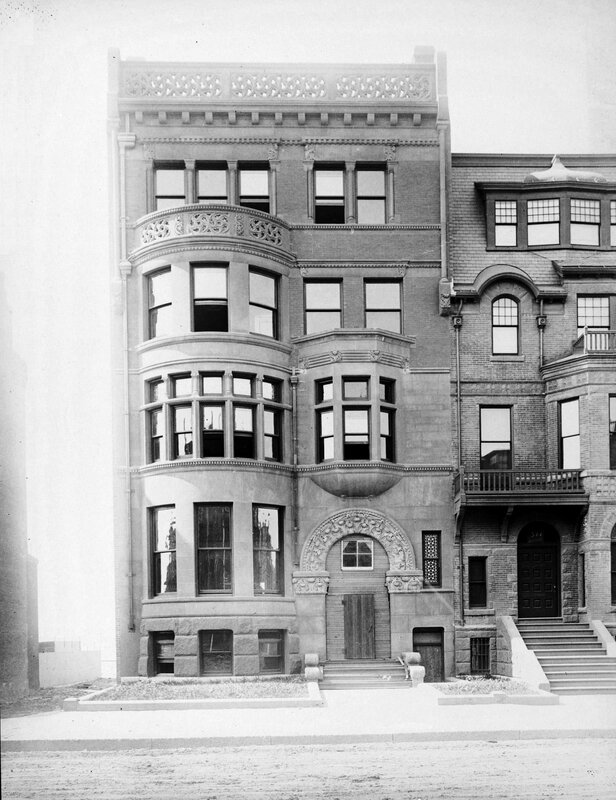 Mary Converse continued to live at 348 Beacon until her death in June of 1940. Costello and Mary Ida Converse had no surviving children and 348 Beacon was inherited by her sister, Frances Eugenia (Converse) Leland, the widow of Lester Leland. She lived at 422 Beacon. On October 18, 1940, 348 Beacon was purchased from Frances Leland by real estate dealer Henry Joseph O’Meara, and on November 5, 1940, it was purchased from him by Robert W. Mueller and his wife, Luise (Louisa) Charlotte Mueller. He was a waiter and later a carpenter. They previously lived at 627 Commonwealth. In November of 1940, he applied for permission to convert the property from a single-family dwelling into a lodging house. He abandoned the permit, but nevertheless began operating a lodging house. On January 7, 1941, they transferred the property into Luise Mueller’s name. In July of 1941, they Muellers were informed by the Building Department of the need to provide adequate egress. In May of 1943, he filed for (and subsequently received) permission to install fire balconies and legalize the occupancy as a lodging house. 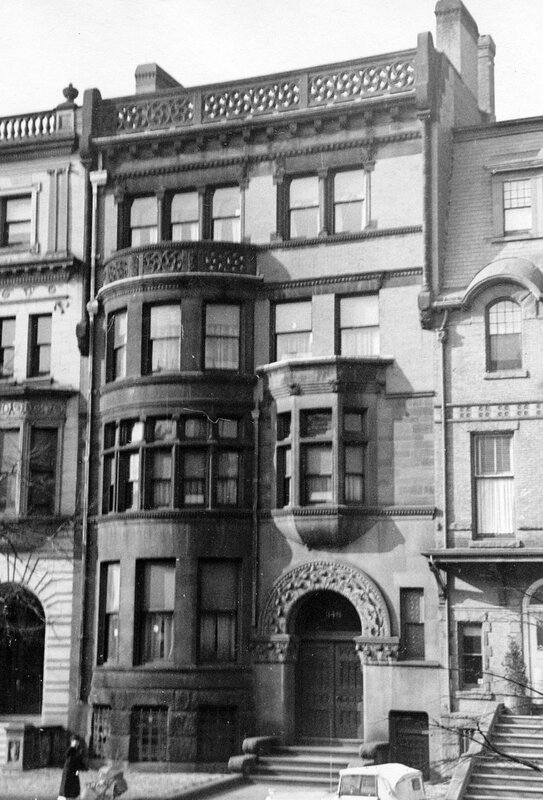 The Muellers continued to live at 348 Beacon until about 1945. On April 26, 1946, 348 Beacon was acquired from Luise Mueller by Mrs. Eleanora (Nevina Maria Luisa) (Iandoli) Dell’Orfano, the former wife of Michele Dell’Orfano. In October of 1953, she filed for (and subsequently received) permission to convert the property from a lodging house into twelve apartments. She lived in one of the apartments. On February 14, 1966, she transferred 348 Beacon to her daughter, Constantina (Dell’Orfano) Giambro, the wife of Nunzio F. Giambro, with the right to continue living in her apartment and receiving the rents from the building. Nunzio and Constantinaa Giambro lived at 41 Fairfield. Eleanora Dell’Orfano continued to live at 348 Beacon in the mid-1970s, and possibly until her death in 1977. On May 12, 1999, Constantina Giambro transferred 348 Beacon to her son, Dario Giambro. On September 22, 2003, 348 Beacon was purchased from Dario Giambro by the Beacon 348 Associates, LLC. In February in 2003, it filed for (and subsequently received) permission to convert the property from twelve apartments into five units, including constructing a penthouse. On March 24, 2005, it converted the property into five condominium units, The Residences at the Converse Mansion Condominium.